Much of India’s handloom industry is fading into history. To save it is an effort. One such small town in Madhya Pradesh, Maheshwar‘s weaving tradition dates back to 1500 years. It bordered on obsolete till REHWA, a non-profit organisation started by Richard Shivaji Rao and Sally Holkar, took on the onus of keeping Maheshwari alive amongst the fashionable ranks. This is a pure amalgamation of cotton and silk. 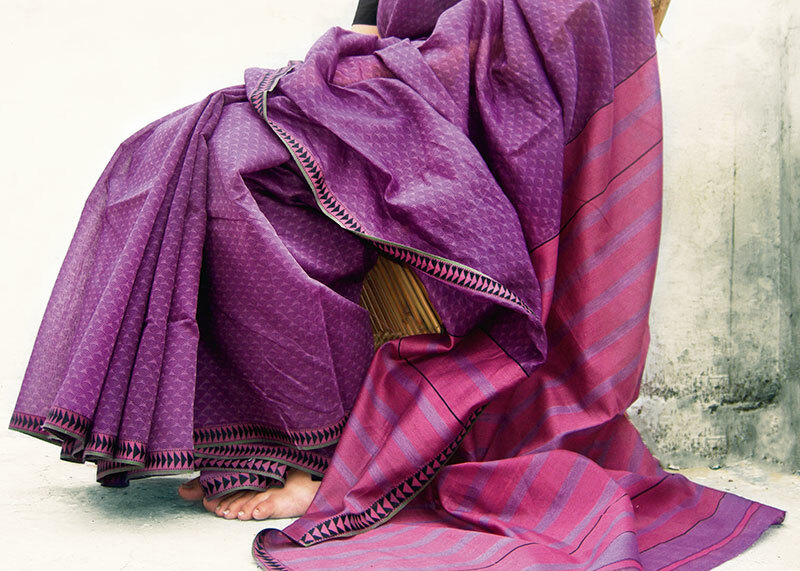 The loomed textile is more often than not spotted as borders on saris and dupattas. Ethreal, sheer and diaphanous best define the personality of Maheshwari – one that holds an opulent aura that appeals to an ilk that appreciates traditional warps. 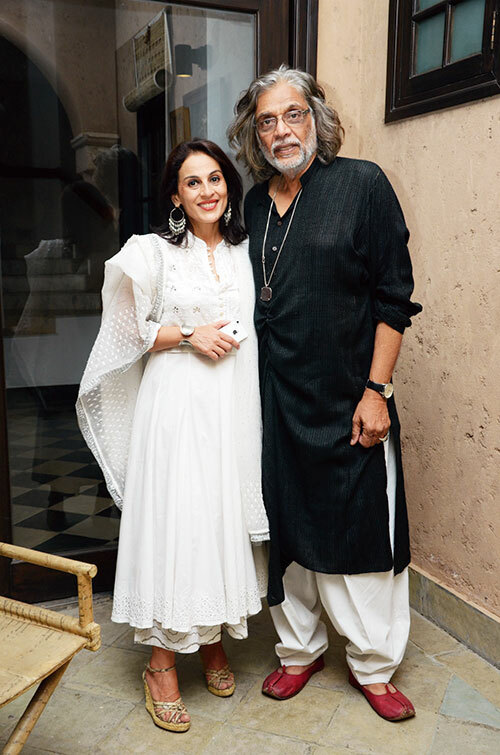 When Muzaffar Ali was acquainted with the project, he took an active interest in it by introducing the world to his creations in this fine cotton-silk handloom. The Manik Bagh Collection is a tribute to HH Yeshwant Rao II and the Holkar heritage of weaving the threads in the celebrated town at the heart of India. WHICH TEXTURES HAVE YOU PLAYED WITH FOR THIS COLLECTION? Simple geometric art deco textures. WHAT HAS INSPIRED YOUR CREATIONS FOR THIS EXHIBITION? Richard’s father, Maharaja Yashwant Rao Holkar, was a great patron of the style of his time – the Art Deco. I saw bits of it at the Manik Bagh Palace, Indore. This was when I had met Richard in the early ‘70s. I could relate to this nostalgic connect because he was a contemporary of my father, who was a stylish person in his own way. 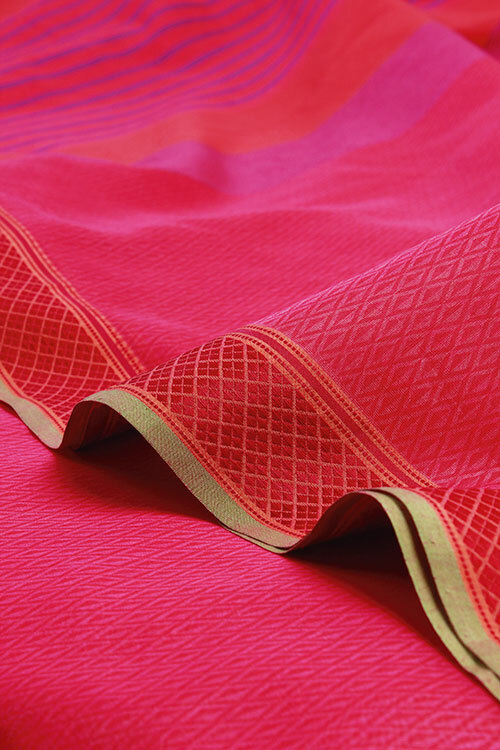 The borders and the pallu were Art Deco abstractions of the traditional Maheshwar idiom of weaving. HOW WOULD YOU LINK THIS COLLECTION TO THE CONTEMPORARY WOMAN? The contemporary woman is a global woman with evolved sensibilities. And on a subliminal level saris are her ultimate design statement. HOW DIFFICULT IS IT TO REVIVE INDIA’S TEXTILE INDUSTRIES? It needs a very serious and committed long term design effort. The government does a lot, except putting soul into the product. The country is so varied and diverse that only some pockets of weaving are being able to rise up to the present day challenge. REHWA is one. I have been associated with REHWA since its inception, and we still have a long way ahead. WHAT IS YOUR TAKE ON NEW-WAVE DESIGNERS? There are many promising names but very few weavers. They need a deep cultural connect to contribute to the continuity of weaving. WHOM DO YOU SEE AS BEING MORE CREATIVE? 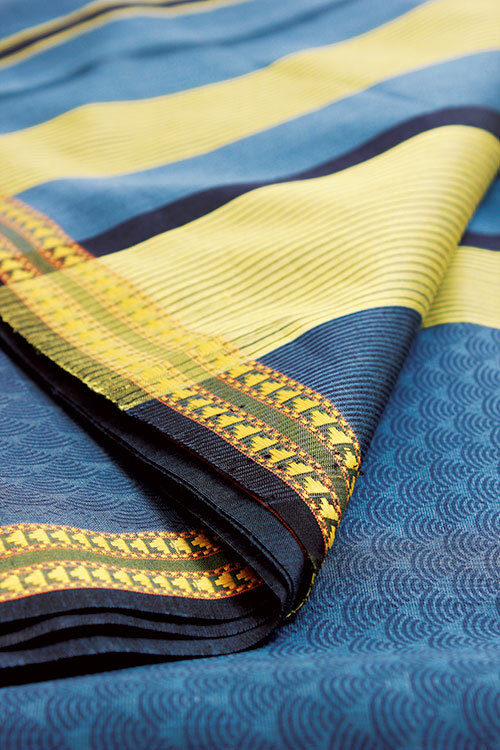 As far as weaving is concerned, Neeru Kumar is a name that comes to mind. The exhibition will be held at Artisans Centre for Art, Craft and Design, Mumbai on August 9-10, 2013.